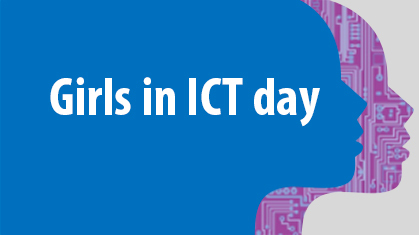 The Girls in ICT Day initiative is a joint effort between the ITU, the United Nations specialized agency for information and communication technologies, and UN Women, The United Nations Entity for Gender Equality and the Empowerment of Women, a UN entity working for the empowerment of women. The initiative is a global effort to create a environment that encourages, educates and empowers girls and young women to pursue studies and careers in information and communication technologies (ICT). Since 2011, more than 240,000 girls and young women have taken part in 7,200 Girls in ICT Day celebrations in 160+ countries worldwide. With the number of school girls opting to study technology-related disciplines in decline in most countries worldwide, ITU is committed to championing the catalytic role a tech career can play in creating exciting, far-reaching opportunities for women and girls. The event includes a hackathon, designed to give the girls an interactive day, with hands on experiences to create and innovate, using ICT tools to create mobile apps, apply robotics, animation, video messaging etc. As part of Girls in ICT Day Caribbean, Lloyd participated in a panel discussion on April 27, 2017, hosted by Dr. Gunjan Mansingh, University of the West Indies, Jamaica entitled, “The Future of Women in Tech – Driving Business Innovation.” Fellow panelists included Zorica Pantic, President Wentworth Institute of Technology, Boston, Frances Correia, Country & Territory Manager, Microsoft Trinidad, Eastern and Southern Caribbean, and Prof. Cardinal Warde, Professor of Electrical Engineering MIT, Boston. How can education in STEM, Hackathons, coding camps and other initiatives bring more young women into ICT studies? Women make up the about 80% of degree students in the Caribbean, and more than 50% in the U.S. Yet in Silicon Valley we see only 3% women start companies, only 6.5% have a female CEO, and 1.3% have a female founder. How do we bring more of these young women into the industry? How can we leverage technology to create a fertile ecosystem for business innovation, and economic opportunities in multiple sectors? The gender gap in tech is widening globally with only 10% investor funding going to women women-led startups. What can be done to increase funding as we see more women led startups? In addition to the panel, Lloyd taped a special video message, sharing his personal experience and encouraging girls and young women to consider a career in ICT.